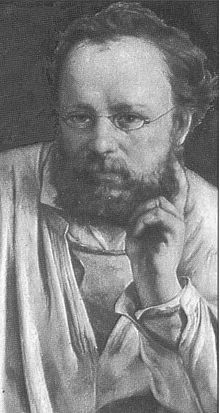 Pierre-Joseph Proudhon (pronounced [ˈpruːd ɒn] in British English, [pʁu dɔ̃] in French) (January 15, 1809 – January 19, 1865) was a French mutualist political philosopher who was the first individual to call himself an "anarchist" and is considered among the first anarchist thinkers. He was a working man, a printer, who taught himself Greek and Latin and wrote numerous books and newspaper articles, as well as founding several anarchist newspapers. His first major work, What is Property? Or, an Inquiry into the Principle of Right and Government (Qu'est-ce que la propriété? Recherche sur le principe du droit et du gouvernement), published in 1840, is famous for the slogan, "Property is theft!" Proudhon’s concept of revolution did not entail violent upheaval or civil war, but rather called for the transformation of society through monetary reform, the establishment of cooperative credit and the formation of workers associations. He opposed both capitalism and state ownership of property, arguing for small-scale property ownership associated with peasants and artisans. He advocated the replacement of state government with a loose federation of “communes,” or local municipalities. Although Proudhon was an independent thinker and had no intention of creating a philosophical system, his ideas remained the most important single influence on French working-class radicalism until the 1920s. His ideas were important to the founding of the First International Working Men's Association, which was broken up by an ideological feud between Marxists and the anarchist followers of Proudhon's disciple Mikhail Bakunin. Proudhon was born to a poor family in Besançon, France. His father was a brewers’ cooper (barrel-maker) and tavern keeper, and at the age of nine Proudhon worked as a cowherd in the Jura Mountains. Until the end of his life, Proudhon was influenced by his country childhood and peasant ancestry, and his vision of the ideal society was of a world in which peasant farmers and small craftsmen like his father could live in freedom, peace, and dignified poverty. Proudhon showed academic ability at an early age, and won a scholarship to the college at Besançon. He developed a taste for learning and retained it even when his family's financial difficulties compelled him to become an apprentice printer and later a compositor. While he learned the printing craft, he taught himself Latin, Greek, and Hebrew, and in the print shop he conversed with various local liberals and Socialists and came under the influence of the utopian Socialist Charles Fourier, a fellow citizen of Besançon. Together with some other young printers, Proudhon attempted to establish his own press, but the venture failed because of bad management. 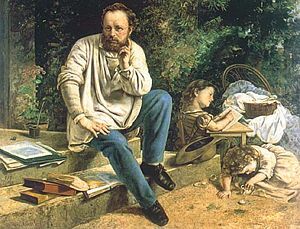 Proudhon continued his interest in writing, developing a French prose difficult to translate but admired by writers as varied as Flaubert, Sainte-Beuve, and Baudelaire. On the strength of this he wrote an Essai de grammaire génerale which had little value, as Proudhon knew nothing whatever of the principles of philology. In 1838 he obtained the pension Suard, a bursary of 1500 francs a year for three years, distributed by the Academy of Besançon for the encouragement of young men of promise. The scholarship enabled Proudhon to study in Paris. In 1839 he wrote a treatise L'Utilité de la célébration du dimanche, which contained the germs of his revolutionary ideas. In 1840 he wrote his first significant book, Qu'est-ce que la propriété? (What Is Property?, 1876), creating a sensation with the declarations, “I am an anarchist,” and, “Property is theft!” Proudhon’s attack was directed, not at the right of the farmer to possess his land and the craftsman to possess his tools, but at the kind of property ownership in which one man exploits the labor of another. Proudhon narrowly escaped being prosecuted for his statements in “What is Property?” He was brought to trial in 1842 for the publication of a still more inflammatory Avertissement aux propriétaires (Warning to Proprietors, 1876), but was acquitted because a jury found that they could not clearly understand his arguments and therefore could not condemn them. In 1843, he went to Lyon to work as managing clerk in a water transport firm. There he encountered a secret society of weavers, the Mutualists, who had evolved a protoanarchist doctrine that the factories of the dawning industrial age could be operated by associations of workers and that these workers, by economic action rather than by violent revolution, could transform society. Proudhon accepted their views and later acknowledged his Lyonnais working-class mentors by adopting the name of Mutualism for his own form of anarchism. Proudhon also met the feminist Socialist Flora Tristan and, on visits to Paris, made the acquaintance of Karl Marx, Mikhail Bakunin, and the Russian Socialist and writer Aleksandr Herzen. For his third treatise on property, which took the shape of a letter to the Fourierist, M. Considérant, Proudhon was tried at Besançon but was acquitted. In 1846, he criticized Marx over the organization of the Socialist movement, objecting to Marx's authoritarian and centralist ideas. When Proudhon published Système des contradictions économiques, ou Philosophie de la misère (1846; System of Economic Contradictions: or, The Philosophy of Poverty, 1888), Marx responded with a bitter attack in a book-length polemic La misère de la philosophie (1847; The Poverty of Philosophy, 1910). In February, 1848, Proudhon abandoned his post in Lyon and went to Paris, to start the paper Le Représentant du people, in which he laid out a program of mutual financial cooperation among workers. He believed this would transfer control of economic relations from capitalists and financiers to workers. The central part of his plan was the establishment of a bank to provide credit at a very low rate of interest and the issuing "exchange notes" that would circulate instead of money based on gold. Proudhon was surprised by the revolt in Paris in February 1848. He participated in the February uprising and the composition of what he termed "the first republican proclamation" of the new republic, but had misgivings about the new government because it was pursuing political reform at the expense of the socio-economic reform, which Proudhon considered basic. During the Second French Republic Proudhon made his biggest impact on the public through his journalism. During the revolutionary year of 1848 and the first months of 1849 he edited a total of four papers; La Représentant du Peuple (February 1848 - August 1848); Le Peuple (September 1848 - June 1849); La Voix du Peuple (September 1849 - May 1850); Le Peuple de 1850 (June 1850 - October 1850), all of which were destroyed in turn by government censorship. In June of 1848, Proudhon was elected to the Constituent Assembly of the Second Republic, but confined himself mainly to criticizing the authoritarian tendencies that were emerging in the revolution and that led up to the dictatorship of Napoleon III. He also attempted to establish a People's Bank based on mutual credit and labor checks, which paid each worker according to the time expended on his product; despite the fact that over 13,000 people, mostly workers, signed up, receipts fell short of 18,000FF and the enterprise was unsuccessful. Proudhon was shocked by the violence of the June Days. He disapproved of the revolts and demonstrations of February, May, and June, 1848, though sympathetic to the social and psychological injustices that the insurrectionaries had endured. He visited the barricades personally, and later reflected that his presence at the Bastille at this time was "one of the most honorable acts of my life," but generally during the tumultuous events of 1848, Proudhon opposed insurrection, preaching peaceful conciliation in accordance with his lifelong stance against violence. In 1849 Proudhon was imprisoned for criticizing Louis-Napoleon, who had become president of the republic prior to declaring himself Emperor Napoleon III, and was not released until 1852. His friends were allowed to visit him in prison, and he was permitted to go out occasionally in Paris. While in prison he married and fathered his first child, edited the last issues of his last paper (with the financial assistance of Herzen), and wrote two of his most important books, Confessions d'un révolutionnaire (1849, never translated) and Idée générale de la révolution au XIXe siècle (1851; The General Idea of the Revolution in the Nineteenth Century, 1923). The latter presents more completely than any other of Proudhon's works the vision of his ideal, a federal world society with no frontiers or national states, free contracts replacing laws, and authority decentralized among communes or locality associations. After his release from prison in 1852 Proudhon was constantly harassed by the imperial police. Unable to publish his writings, he supported himself by preparing anonymous guides for investors and doing other hack work. In 1858, he persuaded a publisher to bring out his three-volume masterpiece De la justice dans la Révolution et dans l'église, in which he contrasted a humanist theory of justice with the church's transcendental assumptions. The book was seized, and Proudhon, who fled to Belgium, was sentenced in absentia to further imprisonment. He remained in exile until 1862, developing his criticisms of nationalism and his ideas of world federation (embodied in Du Principe fédératif, 1863). On his return to Paris, Proudhon began to gain influence among the workers; Paris craftsmen who had adopted his Mutualist ideas were among the founders of the First International just before his death in 1865. His last work, completed on his death bed, De la capacité politique des classes ouvrières (1865), developed the theory that workers must liberate themselves through economic action. Proudhon was the first known theorist to refer to himself as an "anarchist." He says, in The Federal Principle that the "notion of "anarchy" in politics is just as rational and positive as any other. It means that once industrial functions have taken over from political functions, then business transactions alone produce the social order." Proudhon’s earliest works analyzed the nature and problems of the capitalist economy. While deeply critical of capitalism, he also objected to those contemporary socialists who idolized association. In a series of commentaries, from What is Property? (1840) through the posthumously-published Théorie de la propriété (Theory of Property, 1863-1864), Proudhon declared that "property is theft," "property is impossible," "property is despotism," and "property is freedom." These phrases, which aroused considerable excitement, were typical of Proudhon’s inclination to attract attention with alarming slogans while masking the true nature of his thought. In asserting that “property is freedom,” Proudhon referred not only to the product of an individual's labor, but to the peasant or artisan’s home and tools, and the income received by selling his goods. Proudhon regarded labor as the only legitimate source of property; what one produces is his property and anything beyond that is not. He was a libertarian socialist, favoring collective ownership of the means of production by those who used them and worker self-management against capitalist ownership of the means of production. He was not a communist and strenuously rejected the ownership of the products of labor by society, arguing in What is Property? that while "the right to means is common," the "right to product is exclusive." He proposed that the user should own the means of production under supervision from society, with society organizing in order to "regulate the market." [Selected Writings, 70]). Proudhon called this use-ownership "possession," and his economic system mutualism. Proudhon based his arguments against entitlement to land and capital on morality, economics, politics, and individual liberty. One such argument was that such entitlement enabled profit, which led to social instability and war by creating cycles of debt that eventually overcame the capacity of labor to pay them off. Another argument was that entitlement to land and capital produced "despotism" and turned workers into slaves. Property, acting by exclusion and encroachment, while population was increasing, has been the life-principle and definitive cause of all revolutions. Religious wars, and wars of conquest, when they have stopped short of the extermination of races, have been only accidental disturbances, soon repaired by the mathematical progression of the life of nations. The downfall and death of societies are due to the power of accumulation possessed by property. Proudhon, What Is Property? Proudhon opposed both capitalism and state ownership of property, arguing for small-scale property ownership associated with peasants and artisans and believing that "property" should be equally distributed and limited in size to that actually used by individuals, families and workers associations. ("Theory of Property" in Selected Writings of Pierre-Joseph Proudhon. 136, 129, 133, 135) He defended the right of inheritance "as one of the foundations of the family and society" (Steward Edwards, Introduction to Selected Writings of P.J. Proudhon) but refused to extend this beyond personal possessions to the instruments of labor, which belonged to the worker association. Proudhon adopted the term "mutualism" for his brand of anarchism, which involved control of the means of production by the workers. In his scheme, self-employed artisans, peasants, and cooperatives would trade their products on the market. Factories and other large workplaces would be run by 'labor associations' operating on directly democratic principles. There would be no state; instead, society would be organized by a federation of "free communes" (in French, the word “commune” refers to a local municipality). In 1863 Proudhon said: "All my economic ideas as developed over twenty-five years can be summed up in the words: agricultural-industrial federation. All my political ideas boil down to a similar formula: political federation or decentralization." Proudhon opposed the charging of interest and rent, but did not seek to abolish them by law: "I protest that when I criticized… the complex of institutions of which property is the foundation stone, I never meant to… forbid or suppress, by sovereign decree, ground rent and interest on capital. I believe that all these forms of human activity should remain free and optional for all." (Solution of the Social Problem, 1848-1849) He considered that once workers had organized credit and labor and replaced property by possession, such forms of exploitation would disappear along with the state. Proundhon’s concept of revolution did not entail violent upheaval or civil war, but rather called for the transformation of society. This transformation was essentially moral in nature and demanded the highest ethics from those who sought change. It was to be brought about through monetary reform, the establishment of credit and of workers associations, that would bring about the organization of society along new lines. Proudhon criticized the authoritarian socialists of his time period, including the state socialist Louis Blanc. He made few public criticisms of Marx who at that time was a relatively minor thinker. Proudhon's book What is Property? influenced the young Karl Marx’s ideas on the abolition of private property. Marx’s The Poverty of Philosophy, written as a refutation of Proudhon's The Philosophy of Poverty, was the beginning of a historic rift between libertarian and authoritarian Socialists and between anarchists and Marxists. After Proudhon's death, the First International Working Men's Association dissolved in the feud between Marx and Proudhon's disciple Mikhail Bakunin. After Bakunin's death, his libertarian socialism diverged into anarchist communism and collectivist anarchism, with notable proponents such as Peter Kropotkin and Joseph Déjacque. Proudhon was not the first to elaborate the doctrine now called anarchism; his predecessors included the English philosopher William Godwin, in prose, and his follower Percy Bysshe Shelley in verse. There is no evidence, that Proudhon ever studied the works of either Godwin or Shelley. His doctrines of anarchism (society without government), Mutualism (workers' association for the purpose of credit banking), and federalism (the absence of centralized political organization) seem to have been an original reinterpretation of French revolutionary thought, modified by personal experience. Proudhon was an individual thinker who had no intention of creating a philosophical system or founding a political party. His ideas, however, were important in the establishment of the First International Working Men's Association and became the basis of the anarchist theory developed by Bakunin and the anarchist writer Peter Kropotkin. His concepts influenced such varied groups as the Russian populists, the radical Italian nationalists of the 1860s, the Spanish federalists of the 1870s, and the syndicalist movement that developed in France and later became powerful in Italy and Spain. Proudhon remained the most important single influence on French working-class radicalism until the 1920s. His criticisms of government and his ideas of decentralization were revived indirectly in the liberal intellectual movements of the later twentieth century. "Why, how can you ask such a question? You are a republican. "<BR> "A republican! Yes; but that word specifies nothing. Res publica; that is, the public thing. Now, whoever is interested in public affairs—no matter under what form of government—may call himself a republican. Even kings are republicans." "Well! You are a democrat?" "What! "you would have a monarchy?" "Then you are an aristocrat?" "You want a mixed form of government?" "Oh! I understand you; you speak satirically. This is a hit at the government." "By no means. I have just given you my serious and well-considered profession of faith. Although a firm friend of order, I am (in the full force of the term) an anarchist. Listen to me." Copleston, Frederick. Social Philosophy in France, A History of Philosophy, Volume IX, Image/Doubleday, 1994. Proudhon, Pierre-Joseph. Selected writings of Pierre-Joseph Proudhon.Garden City, N.Y., Anchor Books, 1969. All links retrieved March 27, 2019. This page was last modified on 27 March 2019, at 15:30.